Thanks for stopping by! Today, we are making art with Mary Beth Shaw's Private Collection 19.1. The advice of Kim's artwork is a hope. 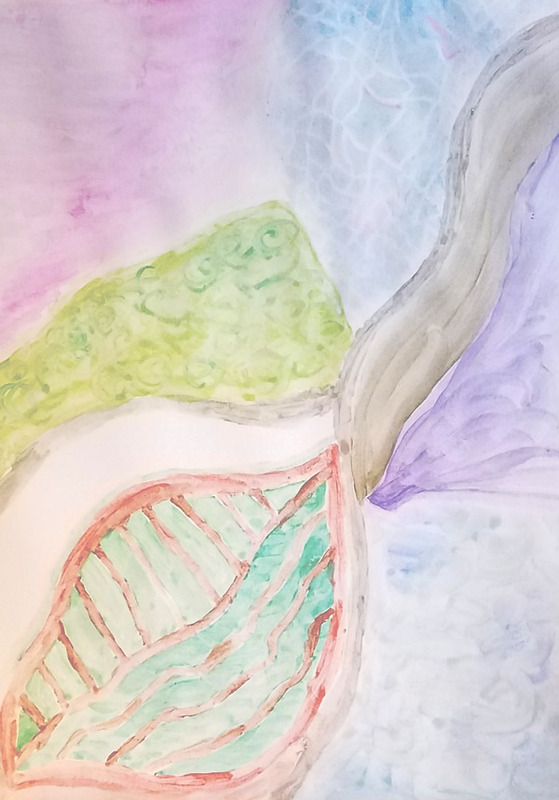 The colors are rich yet subdued over some paper collaged in the background, while the white marks offer a pathway for the eyes. 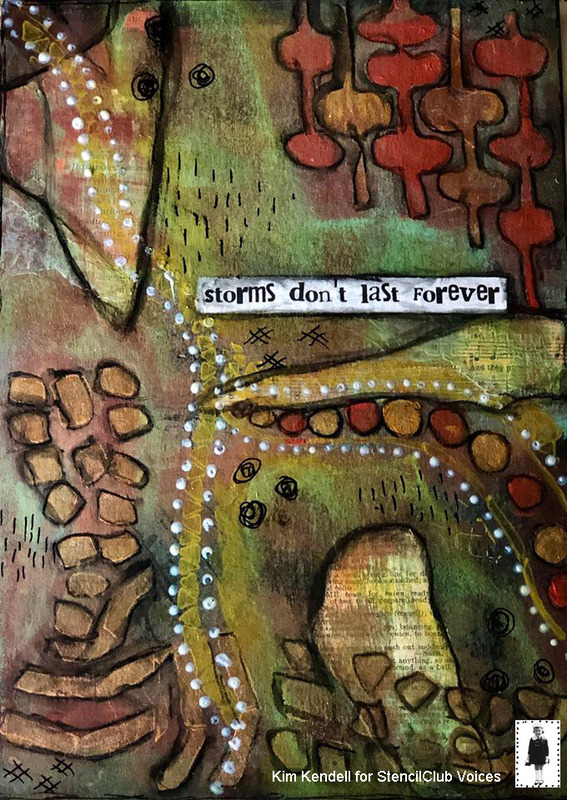 Kim writes: "I took inspiration from the 9 x 12 and 6 x 6 stencils, when I opened my package it screamed Australian indigenous art to me, I have used aspects of Australian indigenous art in the design as well as collage and many layers of paint and colour that have been removed with a wet wipe then reapplied." Take a look in different portions of the painting and see what you spy! 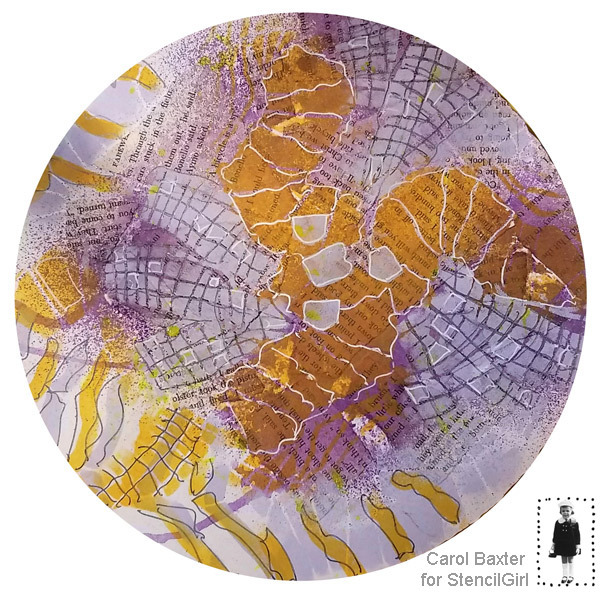 Can you see where the large and small stencils from the February 2019 StencilClub stencils were incorporated? Aquarelle pencil in black-smudged with water to highlight the various areas. Vanessa writes: "I live on a remote Island called Christmas Island - it is an external territory of Australia but situated more closely to Indonesia (300km south of Java, or 2,500km north west of Perth). It's an amazing Island with a unique history, amazing natural environment and a wonderful wonderful community of Chinese, Malays, and Caucasians. "It was originally inhabited in the late 1800s by the British after they found phosphate on the Island. With no indigenous population, the British imported slave labor from China, Singapore, and Malaysia to work the phosphate sites. In 1958, together with Cocos (Keeling) Islands, Christmas Island became an external territory of Australia known as the Indian Ocean Territories.The Island has had an interesting and somewhat turbulent history at times, and even as late as the 1970s the Asian population were not privy to citizen rights, had very different (and very poor) working and living conditions and were not allowed to frequent some areas that were considered to be the domain of the ‘white’ population. "My late father-in-law (Gordon Bennett) came to the Island in the late 70s and appalled at the disparity between the cultural groups on the Island, implemented several campaigns that established citizenship rights for Asian residents, wage equality and freedom of movement. "The demographic makeup of the Island today is very reminiscent of its past, and over 2/3rds of our population are from Chinese decent - some being 3rd and 4th generation Christmas Islanders. Now a harmonious community, Christmas Island has a wonderfully generous and inclusive community, and we have just celebrated the Chinese New Year. 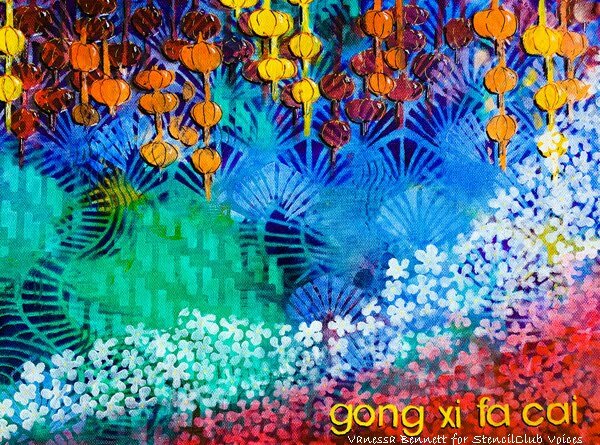 Cries of "Gong Xi Fa Cai" (Happy New Year!) could be heard throughout the community and there were lion dances, lanterns and color everywhere you looked. 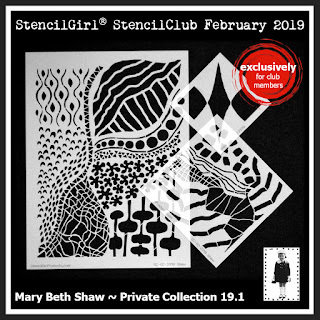 "When I saw Mary Beth’s stencils for February, the lanterns and blossoms reminded me immediately of Chinese New Year, and I knew I wanted to do something to commemorate this important event. The other stencils in the background are from Stencil Girls stencils, L319 Art Deco Wallpaper, S107 Zen Landscape and StencilClub May 2018. The pathways, fans, and lanterns are there to guide you and all your families to prosperity, health, and happiness. I hope you like my painting and the sentiments behind it." Carol Baxter greeting you. I am the luckiest person because I get to see the stencils when they are still in the design stage meaning I get to be excited all the time. Except, the small stencil is bug-like. I'm not keen on bugs. The challenge? To make something I like that is un-bug-like. The large stencil is so dreamy! I stenciled watercolors on mixed media paper for the background, then used acrylics and gel pens on top. I found with the watercolors I could paint in the detail in a lighter color and then make the line or space I wanted from that outline. Here I go: Lazily tubing down the River of Dreams with my friends, past a drunken farm’s fields of corn, strawberries, bell peppers, and purple taters. 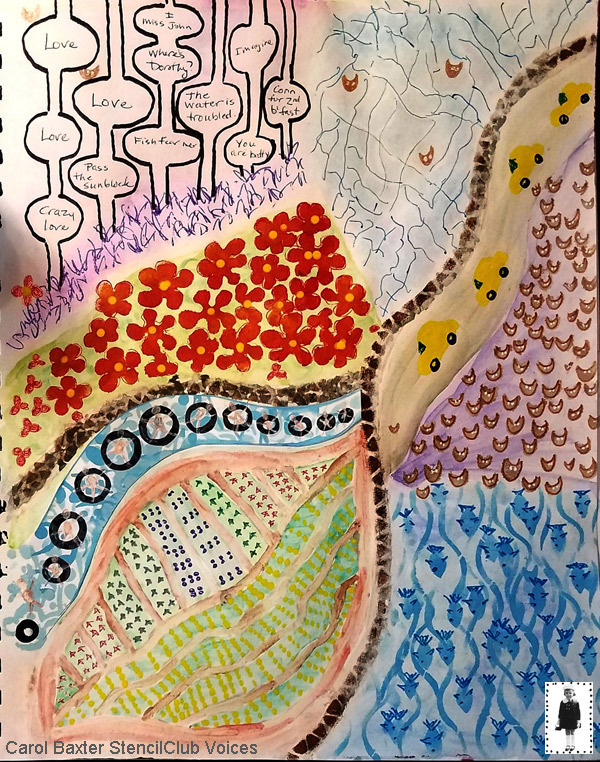 A fence along the shore divides me and my friends from fields of poppies and the dreams they might inspire… a net to catch a river full of fish and owls flying out en masse from under a bridge full of Beatles, each in their own, yellow of course, VW Beetle. You may have noticed the hair from Sandee Setliff's Music Geek Stencil forms the water under my tubers. I grew up tubing down the Salt River and ya gotta have tunes! You can watch Mary Beth's reveal video here. We'd love to have you in StencilClub. Get the details and join via this link. Lovely artwork. And I especially like the words on the first one. All beautiful pieces with unique interpretations. Christmas Island history lesson. Yes!